In April, we spent three weeks in Xi’an, China, teaching conversational English. David and the rest of the group were at Goa Xin No. 2 School, a new (2006) facility with 1,200 students in grades 1-9. English instruction begins in grade 1, so after a few years the students are fairly proficient in reading and writing, but have much less experience speaking and listening. For the students and most of the teachers, this was their first interaction with native English speakers. Classes are large, 45 or more. Group chanting and singing are standard activities. Having a regular teachers in the classroom helped greatly with translation and, occasionally, discipline. David’s routine was to introduce himself with his English and Chinese (Da Wei) names, using a map and photos to locate Brockport and illustrate words like “canal,” “bridge,” and “boat.” This was followed by whatever useful could be found in their text books and questions from the students: “Do you like Chinese food?” and the like. Halls and classrooms are adorned with portraits of Confucius, Marx, Mao, Edison, and Einstein—an improbable assortment. Midmorning the students are lined up outside for half and hour’s exercises done in unison. Midafternoon, there is a five-minute break for the students massaging their eyes--traditional medicine. 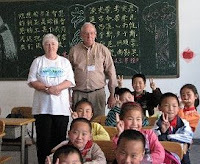 For the first two weeks Peggy (Ke Jing) was at La La Shou Special Education Center, a small (60 students) private school. The Chinese government does nothing for autistic or otherwise several handicapped students, so two mothers created this school. Peggy worked with six students, a teacher, and an aid or two. One Sunday, we attended the Dong Da Jie (East St.) Christian Church, located within the medieval City Wall. The 10:00 a.m. service was the third of three. The sanctuary seats about 400 on wooden benches, with two overflow areas for another 150 or so. The service was in Chinese, but the structure was familiar. There were hymns with familiar melodies such as “This is My Father’s World,” a unison Scripture reading, litanies with frequent “Amens,” a long sermon, and a benediction. The congregation brought their own Bibles and hymnals (words only). A collection box in the courtyard replaced a collection during the service. A couple of people helped us with translation as we introduced ourselves to the pastor after the service. The experience was more than worth our while. Our Team Leader, Hu Di, belongs to the Nan Jiao (South Suburb) Christian Church. It has a membership of about 800, adds an average of ten new members a week. Services are held in a rented hotel dinning room. The congregation is divided into groups of about 25, which meet weekly for Bible study and prayer. Of course there was time for sightseeing. In addition to the famous Terra Cotta Warriors (before 220 BC), we visited the Provincial History Museum, the beautiful Famen Si Buddhist Temple (147 AD), the Taoist Temple of the Eight Immortals, and the Great Wild Goose Pagoda (648 AD). We did not get into the Great Mosque (9th cent. ), home of Xi’an’ substantial Muslim community. Finally, thanks to the Trustees for a grant from the Tooley Fund which defrayed some of our expenses!